Well, apparently the first of the excellent "Big Mike" books, Desert Cat, is out of print. Imagine my surprise! I 'discovered' Garrison Allen while visiting my grandmother in Australia. His style is hilarious. I know it sounds strange for me to laugh myself silly while reading a murder mystery, but I do. 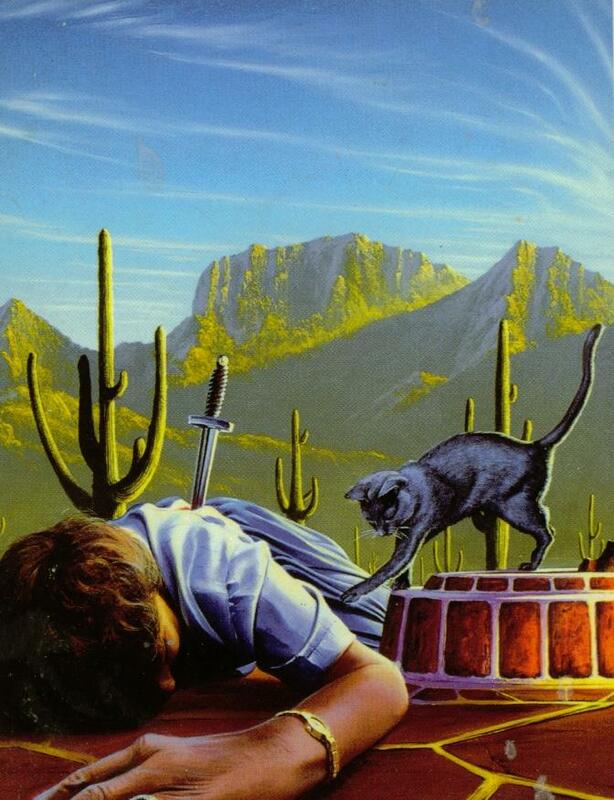 Desert Cat was actually the fourth one I read and by the time I got it from the Clark County (Nevada) Library I was already hooked, but it's always fun to read the whole series and the first one tells the reader more about the recurring characters than the latter ones do. Desert Cat involves the lady who believes she runs the town, but is actually quite disliked in the community, being found dead. Penelope and 'Big Mike' get involved when a posthumous message gets delivered to her bookstore, "Mycroft & Company." But book two, Stable Cat is still in print. The third book I read, this one is fun too. We see more of the oddball residents of Empty "By God" Creek, Arizona while Penelope tries to find out who swiped the champion horse and got hers too! I read Royal Cat, the third book first while I was in Australia. I had to wait till I was back in the states to find/read book four, Baseball Cat. Plus a minor league Baseball team! And who else is to investigate when the manager of the fledgeling team is found with his head bashed in by a bat? The whole damned community, that's who. Then I actually had to wait for the fifth book, Dinosaur Cat to come out before I could read it. Ever since reading Jean Auel's Clan of the Cave Bear I've had a minor interest in paleontology and Dinosaur Cat went beyond the prehistory of mankind to the dinosaur age. The question of the week is who killed the attractive young paleontologist? Though it seemed the wait for the latest book, book 6, Movie Cat to come out was awfully short! Obviously they're making us pay for that quick pause with the wait for another book... When will it be out!!! I know for my other authors it never seems that we have a reasonable wait-time between books, I found Movie Cat provided no tortuous wait. Penelope's sister, B-movie Queen, Stormy is to star in a fantastic new movie actually filmed 'on location' just outside town and for extras the director has the whole town to choose from. But he has to hurry. Everybody hates him and there's no surfeit of likely candidates for 'perp' when the director is found dead.